I'm so happy about this post!! 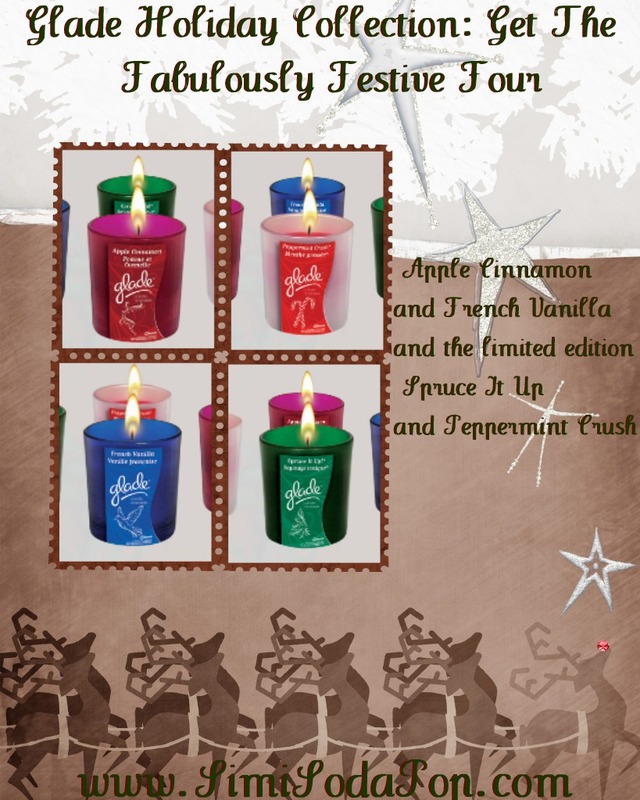 Glade has released their 2011 Holiday Collection of their beautiful candles. Glade candles are my favorite candles! They have such gorgeous scents and I just love them! I especially adore them around the fall/winter time. Every year Glade releases a few holiday scents and this years scents part of the Glade Holiday Collection are..
Apple Cinnamon and French Vanilla and the limited edition Spruce It Up and Peppermint Crush. I usually pick them up at my local Walmart in a 4 pack of the candles, one of each scent for around $10.00. They are a really cute gift too. I love to stock up on them haha. You can also purchase these holiday scents from glade in some of their other product lines. If your interested in those, be sure to check out their website (link below). So.. hope you all enjoyed this post and I recommend checking these candles out because they are one of my most favorite holiday items, so lovely to have one of my all time favorites the "Apple Cinnamon" scent during my holiday parties. P.s. I'll post a review soon of the scents and how much I like each scent from this years collection, so watch out for that! Check out more Glade Holiday Products below..